Leaks of any kind in your home are a problem, and most will need to be addressed with the help of skilled plumbers. The most troublesome leaks are the sort that escape notice because they’re coming from pipes hidden in walls, floors, or in the foundation. If there’s a leak you can see, you can move fast to have it repaired. For example, water on the bathroom floor that shouldn’t be there? You’ll probably need a plumber. It can create unsanitary conditions, allowing harmful bacteria into your living space. It can cause extensive damage to the floor, the subfloor, the ceiling (if it’s a second-story bathroom) and other building material. The most extreme case—the toilet collapses through the floor! You can call us for plumbing in Montpelier, VT to discover what’s wrong with the bathroom toilet and fix it fast. We’re going to look at another toilet plumbing problem that may not seem like it’s an emergency—but it’s still something you’ll need to have fixed as soon as you can or else it will create a massive amount of water waste. Posted in Plumbing | Comments Off on Why Won’t My Toilet Stop Running? Help! My Toilet Is Overflowing! What Do I Do? We know an overflowing toilet is one of the more alarming events that can occur with home plumbing, right up there with a burst pipe. However, there are steps to take to stop the flow and have it corrected. If you do some planning ahead to prepare for an event like this—and it can happen to any toilet, no matter its age or how well it’s cared for—you can prevent serious water damage and dangers from an overflow of sewage. Remember, helpful professional plumbers are on-call to assist you with bathroom plumbing in Burlington, VT and throughout Northwest Vermont and Northeast New York. Posted in Plumbing | Comments Off on Help! My Toilet Is Overflowing! What Do I Do? The bathroom isn’t at the center of your home life, but it’s certainly one of the essential rooms for getting along from day to day. You need to be able to depend on the plumbing in this room to work each time you need it—a plumbing failure here can result in flooding, water damage, and incredible inconveniences. Should I Replace My Old Bathroom Toilet? When people think about replacing major appliances in their home because of wear and tear from age, the toilet isn’t often one of the first that comes to mind. 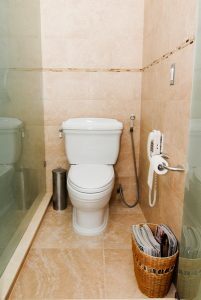 But toilets can suffer from damage due to years of use just as much as an air conditioning system or a furnace. When you consider how necessary a toilet is for day to day comfort and hygiene, knowing when you need to replace the toilet is important. We have some advice on times when it’s a good idea to call up professional plumbers to arrange for a toilet replacement. Posted in Plumbing | Comments Off on Should I Replace My Old Bathroom Toilet?